Royal Doulton Belmont Gold Soup Coupes & Saucers. 1st Quality - H4991. A Few Light Scratches - Almost As New. Quality China At The Right Price! Quality China At The Right Price. Exquisite cup & saucer from Royal Doulton in the "Royal Gold" design (H4980). 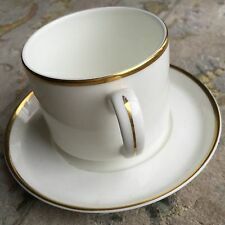 White porcelain with textured gold rim. Good condition, with no chips, cracks or crazing. Other items in this range available - postage will be combined for multiple purchases. Please contact me for further details. 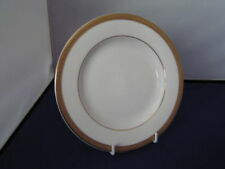 Royal Doulton is now part of WWRD Holdings Ltd.
Royal Doulton Langdale Gold 5 3/4 Inch Saucers - H5228 - NEW! Royal Doulton Langdale Gold Saucers. In New Unused Condition. Quality China At The Right Price. The pattern consists of classic white body with 2 lines of gold gilt trim to the outer rim, the outer one being wide and the inner band being a thin line of gilding which is in excellent condition. for overseas we can combine up to 2kg (maximum weight per parcel). 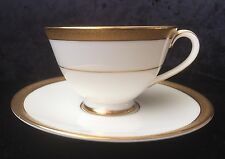 This is a Royal Doulton Gold Concord tea cup & saucer. This attractive pattern was produced by Royal Doulton from 1982 through 1998 and is now discontinued. It features an ornate rim design with scrolls and flowers in pink, blue and yellow. This five-piece place setting is previously owned and in great condition with only some light scratches on the salad plate and bread & butter plate. This elegant pattern was produced by Royal Doulton from 1966 through 1992 and is now discontinued. It features a gold filigree edge with gold trim and verge. These salad plates are previously owned, intact, and a great value with clear signs of use or wear. 8" diameter. This elegant pattern was produced by Royal Doulton from 1965 through 2008 and is now discontinued. It features a gold encrusted edge and gold verge on white. These cups and saucers are previously owned and in great condition with little or no signs of use or wear. 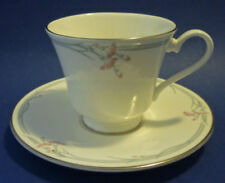 Royal Doulton BELMONT Footed Cup & Saucer H4991 SHOWROOM INVENTORY from Dishfunctional. 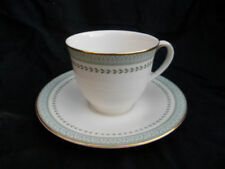 One (1) Footed Cup & Saucer Set by Royal Doulton in the Belmont pattern H4991. This elegant pattern was produced by Royal Doulton from 1967 through 1992 and is now discontinued. ROYAL DOULTON OXFORD GOLD CUP AND SAUCER. THE CUP STANDS 2 3/4" HIGH AND IS ABOUT 3 1/2" WIDE, THE SAUCER IS 5 3/4" WIDE. BRIGHT GILDING, CLEAN INSIDE AND OUT. MORE TABLEWARE AND COLLECTABLES AVAILABLE @ CHINAFIND. This elegant pattern was produced by Royal Doulton from 1966 through 1992 and is now discontinued. It features a gold filigree edge with gold trim and verge. These bread & butter plates are previously owned and in good condition with only slight visible signs of use or wear.6 1/2" diameter. This elegant pattern was produced by Royal Doulton from 1966 through 1992 and is now discontinued. It features a gold filigree edge with gold trim and verge. These place settings are previously owned and in great condition with little or no signs of use or wear. dimensions: dinner plates: 10 1/2" diameter salad plates: 8" diameter bread & butter plates: 6 1/2" diameter cups: 2 1/2" height x 3 7/8" diameter saucers: 6 1/8" diameter. This elegant pattern was produced by Royal Doulton from 1966 through 1992 and is now discontinued. It features a gold filigree edge with gold trim and verge. These cups and saucers are previously owned and in great condition with little or no signs of use or wear. 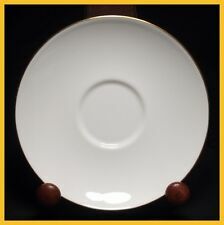 cups: 2 1/2" height x 3 7/8" diameter saucers: 6 1/8" diameter. This elegant pattern was produced by Royal Doulton from 1966 through 1992 and is now discontinued. It features a gold filigree edge with gold trim and verge. This platter is previously owned and in good condition with only slight visible signs of use or wear. This elegant pattern was produced by Royal Doulton from 1966 through 1992 and is now discontinued. It features a gold filigree edge with gold trim and verge. These cups and saucers are previously owned and in great condition with little or no signs of use or wear. cups: 2 5/8" height x 2 1/4" diameter saucers: 5" diameter. This elegant pattern was produced by Royal Doulton from 1966 through 1992 and is now discontinued. It features a gold filigree edge with gold trim and verge. This gravy boat is previously owned and in great condition with little or no signs of use or wear. 3" height to spout underplate: 6 3/4" length. 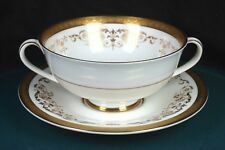 Royal Doulton GOLD LACE Footed Cup & Saucer Bone China H4989 SHOWROOM INVENTORY from Dishfunctional. 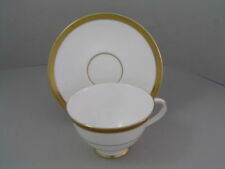 One (1) Footed Cup & Saucer Set by Royal Doulton in the Gold Lace pattern H4989. This elegant pattern was produced by Royal Doulton from 1966 through 1992 and is now discontinued. This elegant pattern was produced by Royal Doulton from 1966 through 1992 and is now discontinued. It features a gold filigree edge with gold trim and verge. 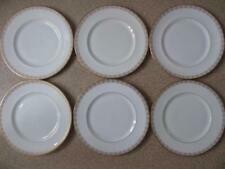 These dinner plates are previously owned, intact, and a great value with clear signs of use or wear. 10 1/2" diameter. This attractive pattern was produced by Royal Doulton from 1982 through 1998 and is now discontinued. It features an ornate rim design with scrolls and flowers in pink, blue and yellow. This platter is previously owned and in good condition with only slight visible signs of use or wear. This attractive pattern was produced by Royal Doulton from 1982 through 1998 and is now discontinued. It features an ornate rim design with scrolls and flowers in pink, blue and yellow. This cup and saucer set is previously owned and in great condition with little or no signs of use or wear. This elegant pattern was produced by Royal Doulton from 1966 through 1992 and is now discontinued. It features a gold filigree edge with gold trim and verge. This vegetable bowl is previously owned and in great condition with little or no signs of use or wear. 10 5/8" length. This attractive pattern was produced by Royal Doulton from 1982 through 1998 and is now discontinued. It features an ornate rim design with scrolls and flowers in pink, blue and yellow. This vegetable bowl is previously owned and in very good condition with only a minor light scratch in the center. This elegant pattern was produced by Royal Doulton from 1966 through 1992 and is now discontinued. It features a gold filigree edge with gold trim and verge. This vegetable bowl is previously owned and in great condition with little or no signs of use or wear. 7" diameter.